Frequently Asked Questions | Alina Sewing + Design Co.
To purchase a pattern, visit my shop, choose the pattern(s) you want and click “Add to Cart.” You may continue shopping, or you may view your cart by clicking the “cart” or the cart icon in the menu bar. From your cart, click “Proceed to Checkout” and begin filling out the required info fields. If you have a coupon code or gift card to redeem, click the appropriate button at the top of the checkout to add them. There will be a reCAPTCHA to click on the bottom left (this protects our site from fraud attempts), and then you may click “Place Order” to complete your purchase. After your purchase is complete, you will receive an email with your link to download. You may also access your downloads at any time from the “My Account” section of our site, which is located in the website footer. You will be able to access your purchased patterns from either the emailed link or the “My Account” section of our site, which is located in the website footer. The pattern will download in a .zip file format. The PDF pattern files are inside of this .zip file and need to be extracted. You need to download this .zip file on a desktop or laptop computer. Mobile devices and tablets do not have the inherent ability to extract .zip files. There are special apps for extracting .zip files on mobile devices and tablets, but I do not have experience with any of them and do not have one in particular to recommend. To extract the files on a Mac computer, double-click on the .zip file. Your PDF files are now available to use as normal. If you are experiencing an issue downloading, please do not continue clicking the link. This will use up all of your allotted downloads, which will result in your order needing to be reset on the backend of our site. To open the PDF files, I recommend using Adobe Reader (available for free here: get.adobe.com/reader/ ). You may use other PDF viewers, but won’t be able to access the separate layers function for printing. If you are double-clicking the file to open it and are receiving an error message instead, then you need to open Adobe Reader, open the “File” menu, click “Open…” and then choose the file you want to open. Some computers don’t have Adobe Reader set to default and seem to have an issue knowing they are supposed to use it to open PDFs. Every pattern includes a “Printing Guide” file, which I recommend you read for information on how to use the tiled PDFs, as well as how to use the layers function to print only one or a few sizes to save ink. The print-at-home files are formatted for both US letter and A4 printing. The copyshop files are formatted for large scale printers, should you wish to skip the tiled pattern assembly. There is plenty of information about this within each pattern’s printing instructions. All of the pattern information you need should be in the individual listing in my shop. There is a size and fabric requirement chart in the listing photos. For more information about making and using each pattern, you should consult my Sewalongs page. Each pattern in my shop has dedicated blog posts and a large amount of information saved for your use and convenience. Every pattern includes seam allowances–they do not need to be added. The included seam allowance for each pattern is noted at the top left corner of the beginning of the step-by-step instructions portion of the pattern’s Instructions file. 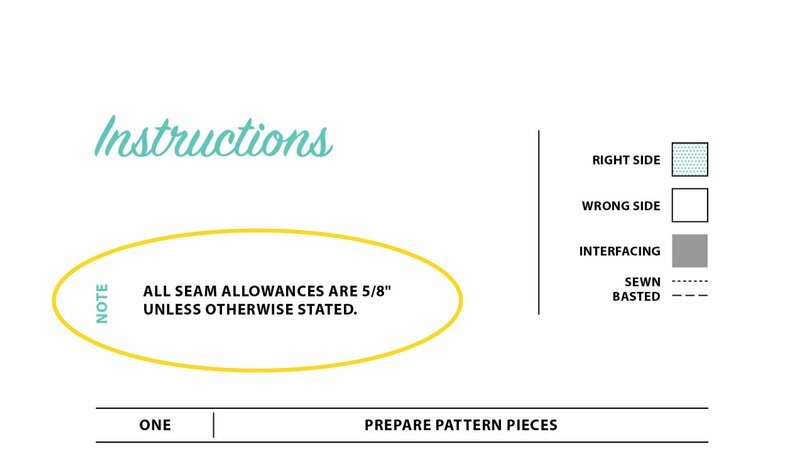 Below is just an example from one pattern–please consult the specific pattern you purchased to find the included seam allowance. My patterns are not intended for commercial use in any way. Patterns released prior to 2017 include a limited permission for you to sell items you’ve made yourself, but you must give credit to the original pattern. Patterns released in 2017 and after do not include that permission and are intended for personal home use only. You may not sell items made from those patterns. It is illegal to copy, share, transmit, distribute or resell the pattern, illustrations or instructions. I reserve all rights to protect my copyright. If you would like to teach a class using one of my patterns, please read through my teaching policies here. In brief, a copy of the pattern needs to be purchased for every user. It is illegal to print, copy, email, or share (in any way, shape or form) the pattern files for anyone other than the person who purchased it. If someone has shared a copy of the pattern with you, and you have not paid for it, please be honest: delete those files and purchase your own copies. Thank you for your honesty, understanding and willingness to support me as I support my family. I host two site-wide sales every year: one in July, and one in November. These sales are typically 20-25% off of every pattern. Outside of that, I provide one coupon every month to my newsletter subscribers, good for that month’s featured pattern. Sign up for my newsletter to take advantage of this opportunity! My patterns are PDF only. If you have an online shop set up for selling PDF patterns, then please contact me for my wholesale pricing and agreement. If you’re a brick-and-mortar shop hoping to sell printed copies of my patterns, then please contact me to be added to the list of interested shops. If/when I begin selling printed patterns, you will be among the first to know.